Hiking in the Adirondack High Peaks in October is tricky. The days are short, the drive up there long, and the weather likely to be rainy and cloudy in autumn, especially at high elevations. But it’s still good hiking weather overall, and the fall colors are vibrant. So I checked the weather a week ago . . . hmmm, maybe hike Saturday instead of Friday . . . then an update a few days ago—Yay! 10% chance of rain Friday! 70 degrees! Perfect. Just perfect. Friday it is. Then I double-checked Thursday night at 10, just before hitting the hay for a good night’s sleep before the morning trek—30% chance of thunderstorms? Not good for being on the side of mountain. I check the hourly forecast. After 4 p.m. Hmmm. Well, that’s doable. I should be well on the way down. 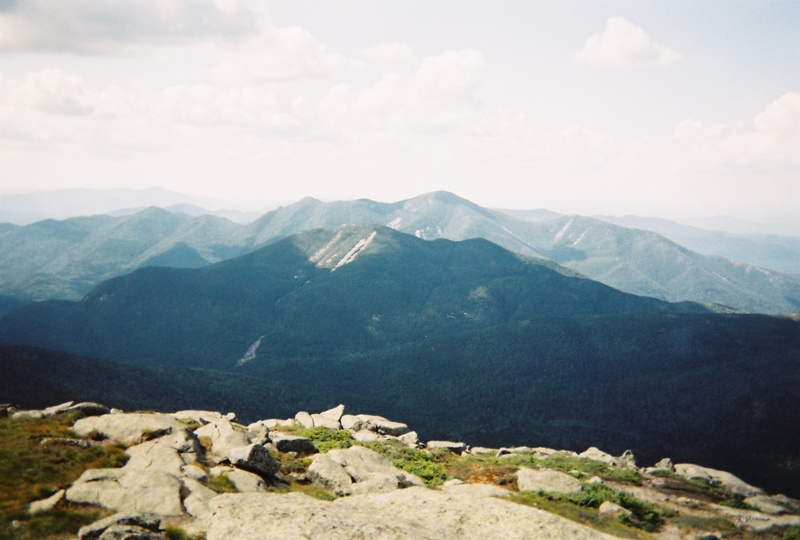 I’ve climbed Algonquin Peak several times before, if not for a while, and although it’s New York’s second highest peak, it’s more of a steep climb than a long one. I’ve done it in six hours round trip. No problem. On the drive up, the heavens pour. Hmm. Well, maybe not in the MacIntyre Range of the mountains, and maybe this early downpour will clear the way for a sunny afternoon. When I arrive at the Adirondack Loj, all is clear. Cloudy, but dry. Except for the ground and rocks. OK. Doable. I see the number for Forest Ranger Emergency Dispatch when I log in to the register. I’ve seen it many times before. Today, I think “I should really add this to my phone.” Seems prudent. Two and a half hours, and I’m still nowhere near the tree line. Hmmm. Seems I’m not as quick a climber as I was a few decades back. Go figure. Well. Despite the clouds coming and going, it’s not thunderstorm weather, as far as I can tell. I calculate what time I need to descend to get back, if not before dark, at least on the flat, well-traveled parts of the trail, the last mile or so. I have a flashlight. And a husky, with a good nose for trail. A white, easy to follow one at that. Things will work out. The summit was gray. Windy, cold, nothing to see but the moss, some alpine grass, and the rocks. Not even birds scavenging for crumbs. I had brought two cameras, since this would be my last chance for a while to get some good shots. Not today. Impermanence. My husky and I settle downwind of a boulder for some supper. Three hours and 45 minutes up. Sigh. At least I’m not sore—the healing stuff I’ve been developing this summer is working well, and I’m looking forward to getting it all down on paper to share. I’m tired, though, and enjoy the rest. It’s an almost 3,000 foot ascent, much of it at the end. A good day’s work. I hope the clouds will clear for a bit, as they had all day. But not today. I wait a little longer than I should, hoping. Let it go. Enjoy the climb for itself. No views today. I started down. Maybe I can make better time descending. I pass a mental marker just at the tree line. Hmm. A little bit of time. Well, all will be well. The rocks are slippery—ironic, since the summer was been so dry, but the last week has been solid rain. I continue down. I’ve never heard such a sound. I lie on the ground on my back, screaming in agony. I had just stepped down from a boulder, maybe three feet, just a little forcefully from the distance. I don’t know what has happened. I’m worried my knee is broken. Very, very not good. I don’t have the gear to spend the night at this elevation. I carefully, breathlessly, attempt to stand . . . OK. I feel my knee. OK. No pain. Probably not broken. I try a few steps. OK—-gasp! Not OK! Keep it straight. It’s the turning that hurts—as in crumbling under me again as I collapse in agony again hurts. I need a staff—but nothing but small vegetation at the edge of the alpine region. Release the pain, Tim. Don’t assume. Don’t reinforce it. See the healthy knee. Good. So slow. I try. I cling to the small branches of the tree line spruce. A few hundred feet. Then a painful collapse. A few hundred feet. Then a painful collapse. A few hundred feet. Then a painful collapse. This is not good. First, it’s going to take forever, and second, one bad fall and I could lose my leg, unable to walk, stuck there. What what else can I do? A few hundred feet. Painful Collapse. A few hundred. Collapse. I hear my own voice, repeating what I often suggest to others: “It’s taken me a long time to learn this—don’t try to do everything by yourself. Get help.” I get out the phone, and dial Forest Ranger Emergency Dispatch. “What is your emergency?” I explain the situation. I can probably get down, but things aren’t good. I do have food and water, plenty. I’m warm. And I have a flashlight (though I’m not sure it’s good for all the hours I’ll need it). The operator has the Ranger call me. He asks several questions. I don’t have any wraps or ibuprofen. I can try wrapping my extra shirt around my knee. The support helps a little. Is there anyone with me. “No, I’m alone,” but as I say that, a party of three comes along behind me, “but some people just came up, so I guess not now.” One of them stays with me. The Ranger will be up with a headlamp, hiking poles, wrap, and ibuprofen. But it will take time. Hours. My new companion finds a staff—just happens to be where he first looks, a six foot dead tree, but strong from the tight layers it grew in the alpine environment. It helps a lot. He looks after my husky, and we start the slow descent down a lot of rock. A few missteps, but much better. A slight drizzle comes, but doesn’t last. The stars come out. The night is warm. We chat. All in all, not a bad time. Impermanence. I’m glad all this happened after learning to release soreness with self-healing. I’m appreciative that a summer of mountain hiking has my muscles easily up to the task—a tender knee combined with sore/weak leg muscles would have been awful. The Ranger arrives eventually, and my new friend moves on to catch up to his party (not that far ahead of us, as it turned out). My knee gets a wrap, I get ibuprofen and hiking poles, and my new Ranger friend takes over husky duty as we enjoy a laborious, but doable and peaceful long slow hike through the wilderness on the way back to the Loj. Usually this trail is brimming with traffic. Tonight, not a soul. Truly, I’m grateful, peaceful. Slow down, Tim. Relax. A bad fall once more. A few painful twinges. But overall, all is well. A long drive home yet, starting near midnight. I’ll pull over later for a couple hours nap, arriving just before dawn to collapse in bed, see what the next day brings. I’d wake to find the knee stiff, but greatly improved. All is well. All is impermanence. Nonattachment. A good day’s lesson. A celebration that I’ve learned the lesson of gratitude. And that New York has such excellent Forest Rangers! Thanks for the peaceful picture. Isn’t it “funny” how things happen…. the ranger’s number THIS time… the people coming along NOW.. that weren’t there before.. Earth in good balance. Glad you’re ok.